Gera Scott Chandler shows her “starter sheet” of polymer that ends up covering a series of her fusion bangles. 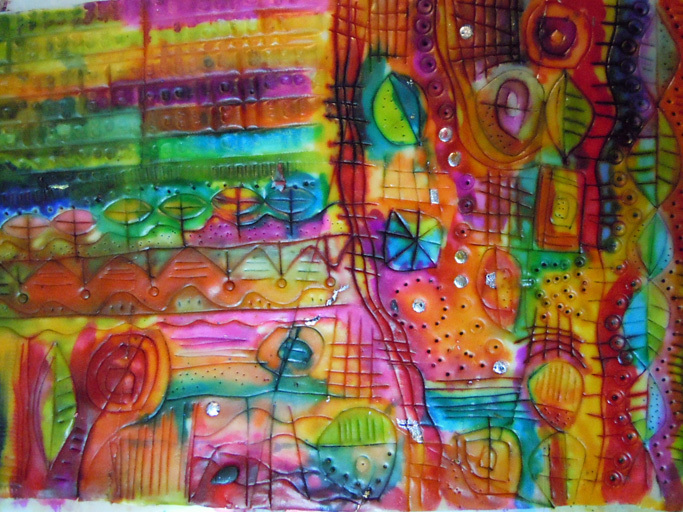 The luminous sheet is a sandwich of polymer, foils, translucent clay and alcohol inks. Loose graphic designs are stamped and scored into the clay. The big sheet is cut into pieces which are fitted and smoothed over bangle bases. The black polymer bases underneath make the overlay glow like faux stained glass. Socket joints stretch and close easily over the elastic that holds them together. A starter sheet is an efficient way to produce a series of companion pieces. It helps, of course, to begin with a signature palette and lots of experience with foils and inks. You’ll see what I mean when you study the colors in Gera’s Flickr site. This is absolutely gorgeous! Her work is amazing, love it all! Beautiful post!!! Gera’s bangle are one of my favorite reference for its clever construction…i love the idea of bangles suiting each wrist. I love you color pallet !!! Seeing your work on Flickr several months ago Inspired me to “boldly go” where I hadn’t before !! Hi Cynthia! Thanks for showing the before and after views of my Fusions process. I can’t think of a nicer way to start my week than finding myself in PCD! Love the colors! Off to check you out Gera! Amazing work everyone. I am amazed at the “quilted” piece over the beautiful wooden bowl. Very clever lady and the results are wonderful. A true family heirloom. Is there a layer of transluscent over this chaotic harmony of colour? It looks – as always – like a summer carnivale. 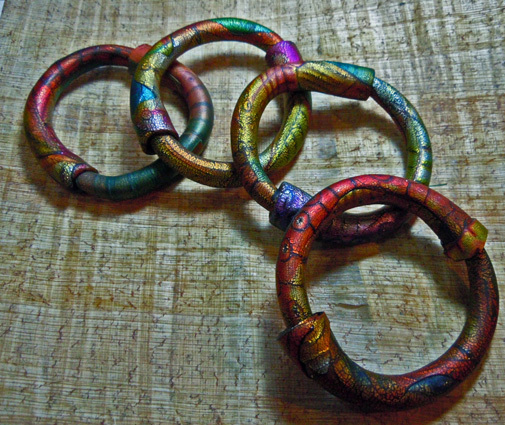 I’m thinking there must be transluscent because of the beautiful finish on the bangles…but its hard to pick on the sheet! Thank you for show us, the beutiful art that we can make from polymer clay.